Here we want to give another example for a closing loop experiment considering six degrees of freedom. Robot motion and localization on natural surfaces, e.g., driving with a mobile robot outdoor, must regard these degrees of freedom. 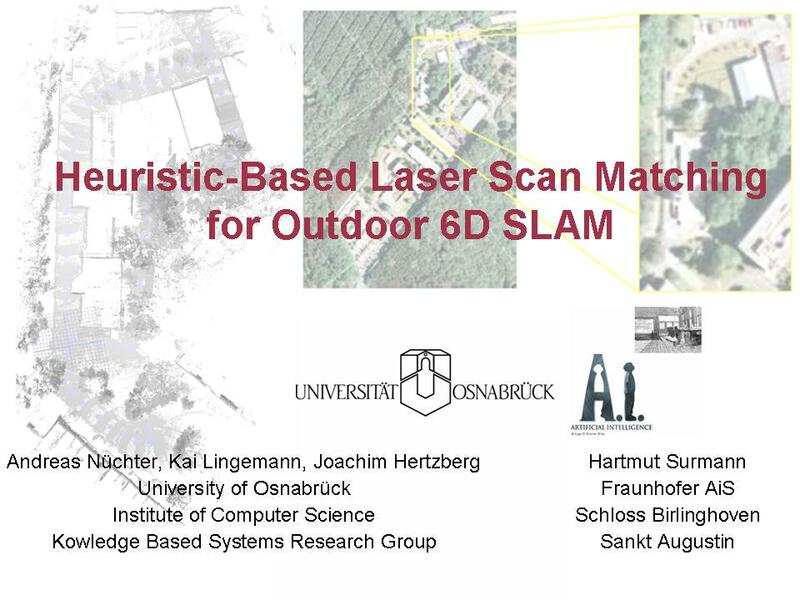 Scan matching, combined with a heuristic for closed loop detection and a global relaxation method, results in a highly precise mapping system for outdoor environments. Download the paper here. The video shows the 6D SLAM result and additionally a smooth trajectory has been computed. The video shows the path the robot has taken, i.e., the camera follows the trajectory. Please use a DivX player to show the video. Note: The grid at the starting point denotes an area of 20 x 20 m2 for scale comparison.